The Liranquois accede to Snow’s demands on Chapter 10, page 4. Yes, that means our adventure will be heading down into Liranequoia. I didn’t think I could tell a story on the colonial frontier of fantasy North America without showing the native nations, but that’s not until Chapter 11. On Monday, we return to Jassart and the Sherbourg crew. 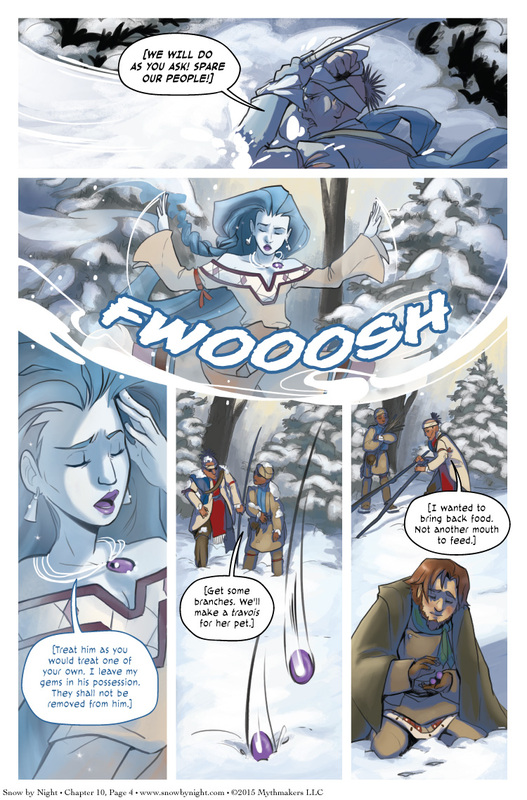 To see Julie’s thumbnails for the next page, please vote for Snow by Night on Top Web Comic. I’ll be out of town this weekend for my nephew’s baptism. Diane will be handling things while I’m away so we’ll be continuing with our normal schedule. I have to say that while I love how the old version of Snow always seemed more stern/grumpy all the time, I love even more how she seems older here, or looks it, probably because she looks tired. I find her more easy to take seriously, honestly. Oh well. I suppose being taken in and fed for the winter is a pretty nice thank-you after all. She just FORCED an entire tribe to take someone in while they are stating that they are already strained and SCARED them with threats when they didn’t immediately heed her command. HUMANS who would do that in any story would be seen as being outright jerks, thugs, tyrants. Why is SHE cool by doing the same thing?! Jeremy does not like Snow. In fact if I remember correctly in previous comics, he wanted her dead and thought Jassert was worth saving. And the hunters were planning to loot and kill the poor guy in need, so not unfair they get they tyrant treatment. She had to insist or her friend who earned her help would be dead as a reward. Snow defending Blaise is her way to thank him for all the crap he had to endure in order to save her. It was stated by Pawns that Snow, while weak, was still able to know what happened outside while in her gems so she must probably knows that Blaise almost died of hypotermia to save her gems from that crow manitou. I was referring to Snow helping Blaise. I realize she is being rather mean to the other guys, but that wasn’t what my comment was discussing. At all. I think Blase may as yet get his explanation, if not from Snow, then from the Liranequois. It seems to me in the last panel from his expression that he does more or less get the broad idea of what just happened – or he will once the Liranequois take him home and decidedly NOT kill him. Just beautiful I love this comic and all the great art styles it has shown. Hope to see more great story and art soon. As for my reaction to this page (and the previous one) I am absolutely in love with Snow’s expressions. She’s acting somewhat like a princess/angry child but considering what she just went through and how Blaise faced Chugan for her I think she’s being smart. She knows she has power over the Liranquois and she’s using it to ensure Blaise (who owes her a debt) doesn’t die. I’m going to keep grumpy-pouty (princessy) Snow in mind now for more poses while in cosplay. That and cats. She is very much like a cat. I don’t blame the natives for not wanting another mouth to feed, but at the same time trying to treat Snows guardian like he’s nothing IN FRONT OF HER is like telling the King of England that his wife is second rate. In fairness to the Liraniquois, they based thier assumptions on who and what Blaise is based on thier previous dealings with the outsiders, and truth is, Blaise IS a common criminal, even though his is helping Snow-by-Night. This is a chance for Blaise to turn his life around, and with any luck, his dealings with the Manitou may wind up being a blessing for the Tribe as well. Snow-by-Night knows exactly what she’s doing. Seeing her falter in frame 3 kinda broke my heart though… It took everything she had to do that. I really found myself wishing she had even spoken to Blaise… did he even understand the language she was speaking to them? And you know, they don’t really honor the spirits as they say they do if their first reaction to a request is outright refusal. I’m just sayin’. She could have offered them like, free ice or something too. Worked in Arendell.